The sable antelope shares the genus Hippotragus with the extinct bluebuck (H. leucophaeus) and the roan antelope (H. equinus), and is a member of the family Bovidae. H. n. niger, the southern sable, common sable, or black sable (also known as the Matsetsi sable or South Zambian sable) is regarded as the 'typical' subspecies, as it was the first to be described and named in 1838. Often referred to as the black sable because it tends to have the darkest coat, this subspecies occurs south of the Zambezi River, particularly in northern Botswana and in large numbers in the Matsetsi Valley of Zimbabwe, but is also found in South Africa. In South Africa, most of the commercial sable farmers crossed their Matsetsi sables (indigenous to South Africa) with Zambian sables in the hope to move nearer to the nearly extinct giant sable (that was larger with bigger horns). Currently, only about 15% pure Matsetsi sables are thought to exist in South Africa. The Matsetsi sable population in Zimbabwe is only 450 (down from 24,000 in 1994). The sable population in South Africa is about 7,000 (commercial and in reserves). Therefore, the Matsetsi sable population apparently is less than 1,500 and declining. However, most of the sables in the reserves are pure Matsetsi sables. Anglo-American recently started a program of breeding pure Matsetsi sables commercially and keeping them pure. H. n. variani, the giant sable antelope or royal sable, is so named because the horns of both sexes are recognizably longer. It is found only in a few remaining localities in central Angola. It is classified as Critically Endangered on the IUCN Red List and is listed on Appendix I of CITES. H. n. roosevelti, the eastern sable or Shimba sable, is the smallest of the four subspecies. It occurs in the coastal hinterlands of southern Kenya, particularly in the Shimba Hills National Reserve and ranges through the region east of Tanzania's eastern escarpment and into northern Mozambique. The sable antelope has a compact and robust build, characterized by a thick neck and tough skin. It has a well-developed and often upright mane on its neck, as well as a short mane on the throat. Its general colouration is rich chestnut to black. Females and juveniles are chestnut to dark brown, while males begin darkening and turn black after three years. However, in southern populations, females have a brown to black coat. Calves less than two months old are a light tan and show faint markings. The underparts, cheek, and chin are all white, creating a great contrast with the dark back and flanks. Long, white hairs are present below the eyes, and a wide, black stripe runs over the nose. Both sexes have ringed horns which arch backward. In females, these can reach 61–102 cm (24–40 in), while in males they are 81–165 cm (32–65 in) long. The average lifespan of the sable antelope is 19 years in the wild and 22 years in captivity. In each herd, the juvenile males are exiled from the herd around three years old. All of the female calves remain, however. When the herd gets too large, it divides into smaller groups of cows and their young. These groups form new herds, once again with only one adult bull. The young males, which have been separated from the herd, associate in "bachelor groups" of up to 12 individuals. Among the bachelors, the most dominant is the first individual to join a new group of females when the position is open. Seldom, during their fights for dominance, they are able to inflict bodily harm to the contender. In English "Great Sable Antelope", "Sable" or the Swahili name mbarapi are sometimes used. An archaic term used in accounts of hunting expeditions in South Africa is "Potaquaine"; the origin and exact application are unclear. Local names include swartwitpens (Afrikaans), kgama or phalafala (Sotho), mBarapi or palahala (Swahili), kukurugu, kwalat or kwalata (Tswana), iliza (Xhosa) and impalampala (Zulu). ^ IUCN SSC Antelope Specialist Group (2008). "Hippotragus niger". IUCN Red List of Threatened Species. Version 2008. International Union for Conservation of Nature. Retrieved 1 November 2008. Database entry includes a brief justification of why this species is of Least concern. ^ Wilson, D.E. ; Reeder, D.M., eds. (2005). Mammal Species of the World: A Taxonomic and Geographic Reference (3rd ed.). Johns Hopkins University Press. p. 718. ISBN 978-0-8018-8221-0. OCLC 62265494. ^ Robinson, T. J.; Bastos, A. D.; Halanych, K. M.; Herzig, B. (1996). "Mitochondrial DNA sequence relationships of the extinct blue antelope Hippotragus leucophaeus". Die Naturwissenschaften. 83 (4): 178–82. doi:10.1007/s001140050269. PMID 8643125. ^ "Sable shenanigans: how Zambia's sable population is falling prey to unscrupulous traders". The Ecologist. Retrieved 2017-07-13. ^ a b "Wildlife as a commodity - Incarcerated by red tape". www.wildlifeextra.com. Archived from the original on November 5, 2014. ^ Jonathan Kingdon; David Happold; Thomas Butynski; Michael Hoffmann; Meredith Happold; Jan Kalina (23 May 2013). Mammals of Africa. A&C Black. p. 557. ISBN 978-1-4081-8996-2. ^ a b c d Nowak, R. M. (1999). Walker's Mammals of the World (6th ed.). Baltimore, Maryland: Johns Hopkins University Press. pp. 1174–5. ISBN 0801857899. ^ a b c Huffman, B. 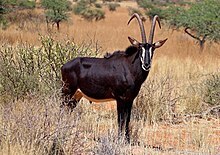 "Sable antelope". Ultimate Ungulate. Retrieved 6 March 2014. ^ a b c d R. D., Estes (1999). The Safari Companion: A Guide to Watching African Mammals, Including Hoofed Mammals, Carnivores, and Primates (Rev. ed.). White River Junction: Chelsea Green Pub. Co. pp. 98–100. ISBN 1890132446. ^ "Hippotragus niger (mbarapi or sable antelope)". University of Michigan Museum of Zoology. Animal Diversity Web. Retrieved 6 March 2014. ^ "Hippotragus niger - Common names". Encyclopedia of Life. Wikimedia Commons has media related to Hippotragus niger. This page was last edited on 12 January 2019, at 07:15 (UTC).